Topic: Latest cyber attacks and vulnerabilities, how it works? Who is affected? What to do? Targets of cyber attacks are not only limited to your personal computer but also your mobile, cars, TVs, door locks, and anything electronics. In this seminar, a few recent cyber attacks and vulnerabilities will be discussed. We will go through technical details to reveal how it works, the damages it made, the mitigation and possible prevention. 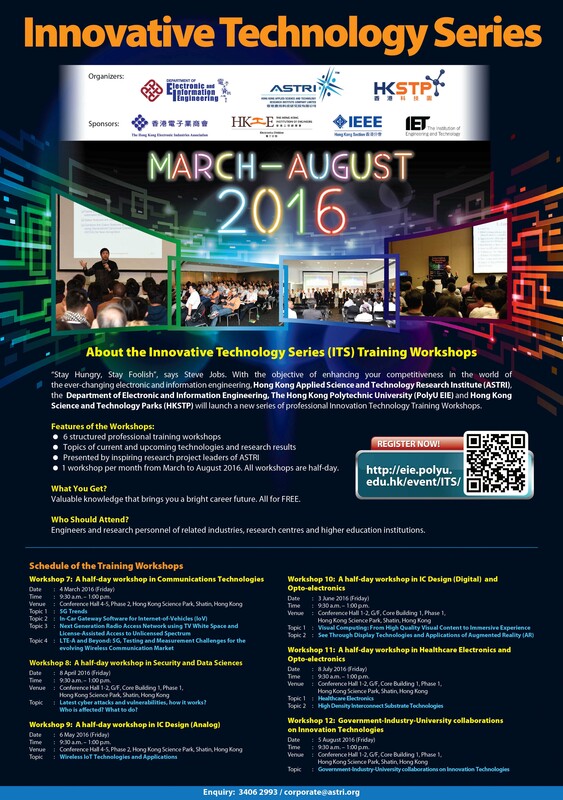 Jointly organized by the Department of Electronic and Information Engineering, The Hong Kong Polytechnic University (PolyU EIE), Hong Kong Applied Science and Technology Research Institute (ASTRI), and Hong Kong Science and Technology Park (HKSTP), the Innovative Technology Series (ITS) seeks to keep the industry and the community abreast of the current and emerging technologies in electronic and information engineering. The ITS will be delivered in a series of 12 structural professional training workshops covering different topics of current and upcoming technologies as well as the latest research results. Presenters of the training workshops will be the professors of PolyU EIE and research project leaders of ASTRI. Overseas experts may also join the training workshops to share their experience with local industry and community.